The weather is changing and I have a taste for some simple comfort food. It doesn’t get simpler or more comforting than chicken and rice. 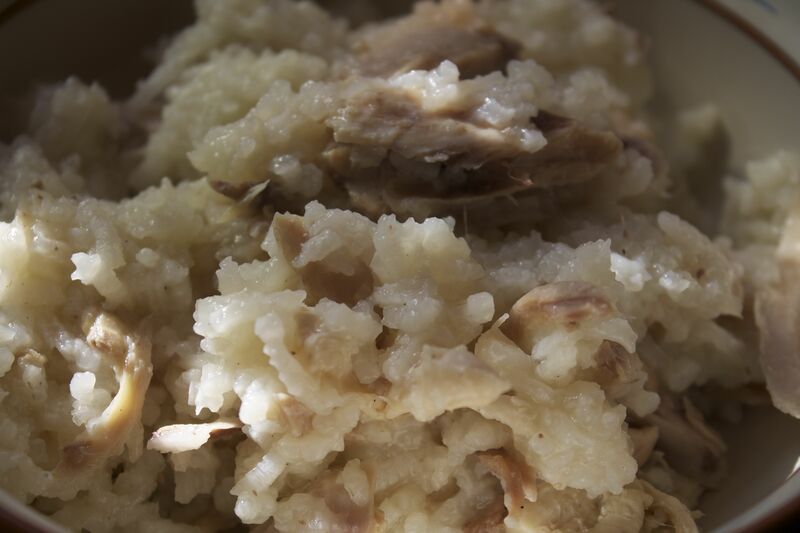 By doing it in the slow cooker, the rice ends up with a risotto like texture. I also make mine very frugally – using the parts of the chicken that would typically go to waste and using celery ends, carrot peels and onion skins that I’ve frozen. 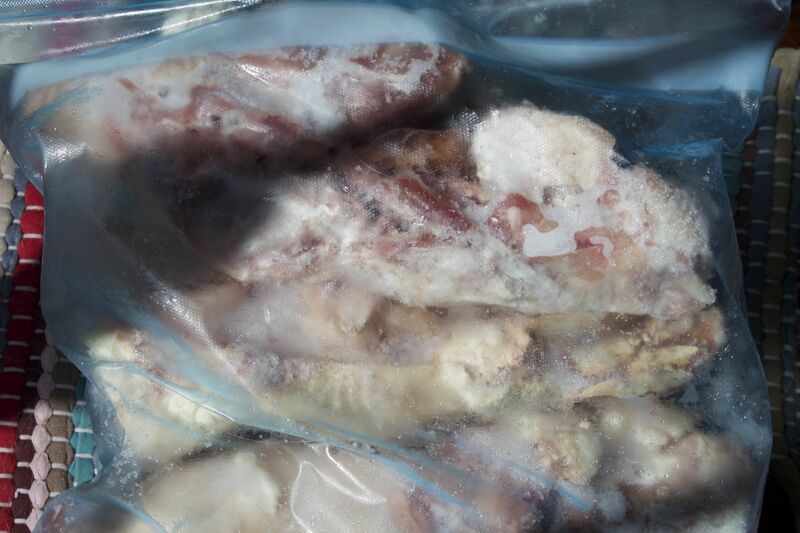 Whenever I roast a chicken, I usually first cut out the backbone and collect the neck and other innards from the cavity and put them in a bag in the freezer. Sometimes, I’ll even cut off the wings, too. It takes two to three chickens done this way to fill a gallon freezer bag and I wait until I have at least two bags. To make stock, I put in two gallon bags of chicken parts (still frozen) and cover with water (usually takes about 3 quarts). If I have a bag of carrot, celery and onion trimmings, I add that or I cut a large onion into about 8 pieces, toss in a couple of celery stalks that I’ve chopped in half, a couple of carrots cut into 1 inch pieces and 2 bay leaves. I then bring the liquid to a boil and simmer for 2 to 3 hours. When the chicken has fallen apart, it is done. I strain out the solids and let the stock sit in the refrigerator overnight so the fat will rise to the top and solidify for ease of discarding. I then pick the chicken meat off the bones. I can usually get 2 cups of chicken out of what I’ve cooked and about 2 1/2 quarts of stock. In a slow cooker add all the ingredients. With homemade stock, I usually start with a teaspoon of salt and pepper. 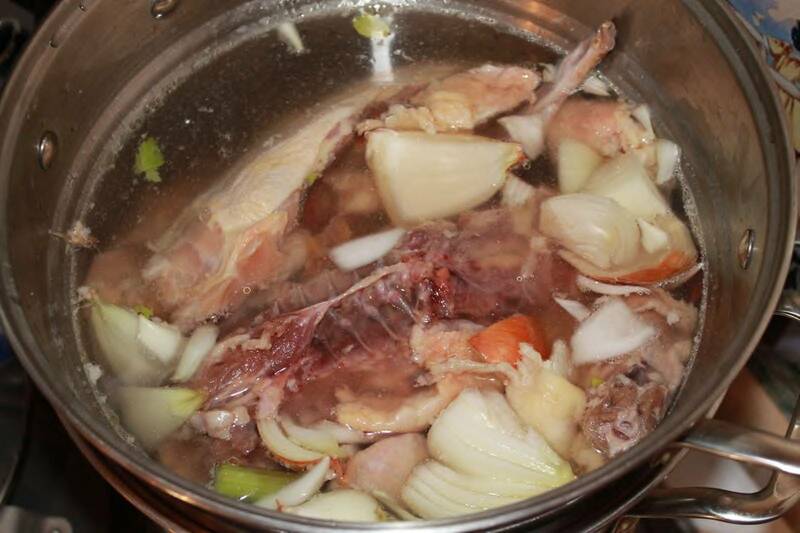 If using commercial stock, wait until the mixture is simmering to taste before adding any salt. Bring to a simmer and turn cooker to low for a couple of hours or until the rice is cooked through and most of the liquid is absorbed. Taste for seasonings. Serve in bowls. There is enough for about 5 servings for a single person out of this – so I divide it into serving sizes to freeze for the times ahead when I need a satisfying meal. This is what happens when you leave the crock pot on for a bit too long when you get distracted by the New Orleans Saints vs Detroit Lions game. Still delicious, though, with the creamy rice so rich with the flavor of the homemade stock.